Are you a beginner? Are you thinking of learning golf? Sign up for a free class from one of our expert instructors. In this one hour introduction to golf you will learn the golf basics, including club swing, stance, and rules. Afterwards you will receive recommendations for continuing on your path to golf greatness. Free classes are for one time attendance only. Your Path to Golf Greatness. You have successfully requested The Beginner Checklist. 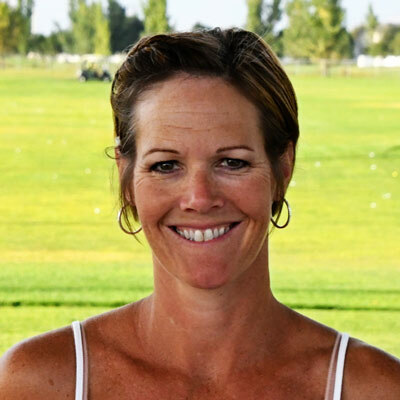 We have set up great programs to help beginning men and women take up the lifelong sport of golf. First, request the golf checklist below. After that, you will also get golf courses by email (unsubscribe anytime.) Get started today on the path to golf greatness! Request the "The Beginner Checklist" PDF link. This is a guide to get you stepping in the right direction. Enter your email to download it. 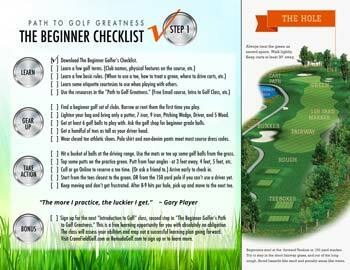 After you download The Beginner Checklist, watch for free golf instructional courses sent direct to your email. These are designed for beginners to ease their way into the game. Sign up for our free "Intro to Golf" one-hour class. Meet a real life instructor who will prescribe the best course of action based on your ability. There are no other obligations. Follow your prescribed skill diagnosis and take advantage of our course programs... Such as Club 99 for women, Spring and Summer Junior Camps, Beginner Passes, Discounted Lesson Punch Cards, and Group clinics. Stick with a plan and practice routine for a full season and beyond. Then watch your skills grow! Class size is limited to 25 students at each location. Please sign up as soon as possible so your student doesn’t miss the cut this year. Make it the best spring break ever! My wife joined club 99 ladies program this month. She has never played golf, but this is a great opportunity for her to learn. "I would recommend Club 99 because it's all ladies that are in it to learn and encourage each other. I liked how relaxed, entertaining it was. And I learned so much. I would go out at least once a week to practice what was taught in class. Most weeks it was with my gal pals, which was great." "Club 99 was fun!! Golfing with a group of gals is better than golfing with your husband anyday. It was VERY informative, no frills and to the point. It was a great value and allowed me to practice and play more than I would have had I not had the pass." "I would recommend because Club 99 helped me fall in love with the sport. Plus doing something for myself helped fill my cup. I enjoyed the pass because it allowed me to spend time with the family out on the course and I could actually play the game. The course was fun for beginners but still good for all levels." "It was a lot of fun! I learned a lot and wasn't pressured to be a pro. We learned the basics and wasn't embarrassed about lack of skill. I golfed more, and with people I would have never met without club 99. Met new neighbors and friendly staff who helped out a lot." "Club 99 was a non-intimidating environment for beginners like me. The instructors were great! And the games were fun and great practice. I like the drills we were given, they helped a lot. 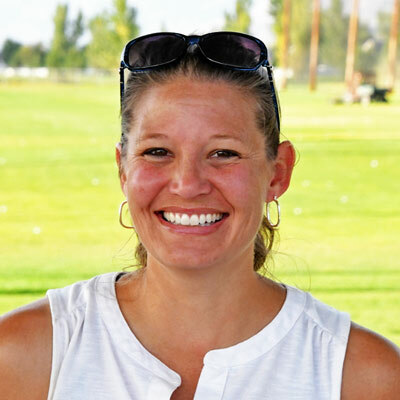 The summer pass got me out golfing more than I would have otherwise." Your junior may be the next PGA phenom! Play with friends in weekly games and practices. Juniors receive weekly instruction, including golf rules and etiquette, skill development, short game, full swing, and on course play. Plus games, fitness, contests for prizes, end of season tournament. – Classes every Tuesday from June to August. Each Tuesday session includes time on the driving range, putting green or on-course training. Instruction courses are customized as students ability increase. Weekly snacks and freebies such as a punch card for golf, a logo towel, and game prizes are included. We focus on fun and learning. Junior’s will also get a chance to qualify for the Remuda Junior prize tournament. Class size limited to first come first serve. 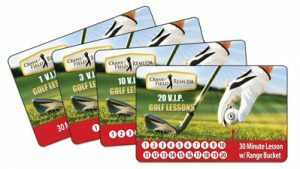 If you are looking to take a series of lessons to really improve your game, punch cards are the way to go. Each punch can be redeemed for 30 minute lesson and bucket of range balls. Instructors are assigned, based on availability. 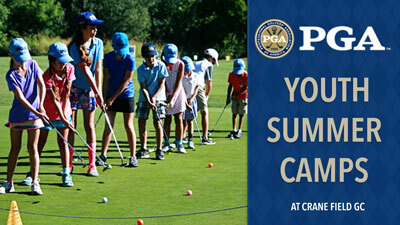 Action-packed camps include hands-on instruction lead by certified PGA Professionals. Low student to instructor ratio (approximately 6:1).